Is your current commercial property lacking protection or aesthetic value? Then you might need to invest in a commercial fence. Is your current commercial property lacking protection or aesthetic value? Then you might need to invest in a commercial fence. The reasons you might seek one out are quite similar to why you would build a fence around your home. Whether it is for increasing your business’ security or privacy, or how it looks, here are a few reasons why you should have a commercial around your property. Has your business has been troubled by vandalism or crime in recent months? One of the main reasons most business owners look for security fencing is to help protect their company’s site and their employees and guests inside the main building. 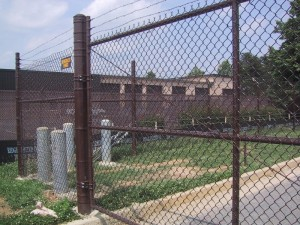 When it comes to a commercial fence, you want to be sure that security is your first priority. To that end, you should consider a chain link fence. Chain link is a durable material that still allows a high degree of visibility – meaning no intruders can find a place to hide behind it. Materials for ornamental fences, such as wrought iron, can help lend a beautiful appearance to your property but it’s also more expensive. How much do you value your privacy? Privacy is another factor that influences commercial fence installation. Much like with security, your customers and clients will appreciate your efforts to protect their privacy. Thinking about a new privacy fence? You can experiment with wood or vinyl, both of which are excellent materials for this purpose. Lastly, consider the current state of your exterior. Even the best business with the most wonderful services and products can’t draw in customers if they aren’t as attractive as possible. However, when you decide on a commercial fence to help improve appearance, think about the aesthetic for the area you are in and the type of company you are – a sporting goods store is going to have a much different vibe than one that sells electronics! This entry was posted on Friday, October 20th, 2017 at 12:08 pm. Both comments and pings are currently closed.